Specific cases are mentioned under GST where no input tax credit shall be available to the applicant. We are going to discuss the ineligibility of input tax credit in the article with examples. ITC is not available for Motor vehicles used to transport persons, having a seating capacity of less than or equal to 13 persons (including the driver). 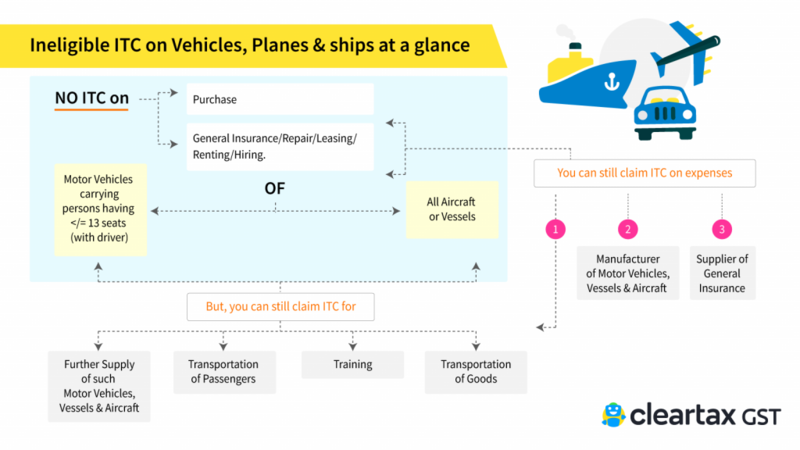 Further, ITC is not available on vessels and aircraft. For example, XYZ & Co. buys a car for their business. They cannot claim ITC on the same. ITC will be available when the vehicle is used for making taxable supplies by the following. a) Supply of other vehicles or conveyances, vessels or aircrafts. For example, Happy Tours purchased a bus for inter-city transport of passengers. ITC is available. c) Imparting training on driving, flying, navigating such vehicle or conveyances or vessels or aircrafts, respectively. A driving school purchases a car to give training to students. The school can claim ITC on the GST paid on the car. However, ITC will be available if the category of inward and outward supply is same or the component belongs to a mixed or composite supply under GST. No ITC is allowed on services of general insurance, servicing, repair and maintenance in so far as they relate to motor vehicles, vessels or aircraft referred to in (1). X, a Managing Director has taken membership of a club and the company pays the membership fees. ITC will not be available to the company or Mr. X. For example, assuming the government passes a rule for all employers to provide mandatory cab services to female staff in night shifts. ABC Ltd. hires a rent-a-cab to provide to transportation to its female staff on night shifts. Then ITC will be available to ABC Ltd. on the GST paid to the rent-a-cab service. For example, ABC Travels lends out a car to XYZ Travels. Then XYZ Travels can claim ITC on the same. c. leasing, renting or hiring of motor vehicles, vessels or aircraft with exceptions same as those mentioned for (1). Read our article on GST impact on cab services. ABC Ltd. offers a travel package to its employees for personal holidays. ITC on GST paid by ABC Ltd. for the holiday package will not be allowed. ITC will be allowed for travel for business purposes. Please read our article to know more about the impact of GST on air fare and rail fare. Please read our article on GST impact on works contract. Ajay Steel Industries constructs an office building for its headquarters. ITC will not be available. Ajay Steel Industries also constructs a blast furnace to manufacture steel. ITC is available since it is a plant. Please read our extensive guides on composition scheme under GST and whether you are eligible for it. Please read our articles on GST on non-residents and the registration process for non-residents. No ITC will be available for the goods/ services used for personal purposed and not for business purposes. Find out more on how to calculate the amount of common credit applicable for business if you use the same input for both business and personal uses. Read our analysis of the impact of GST on restaurants. Please also read our articles on conditions to claim ITC under GST and rules for common credit for inputs under GST. 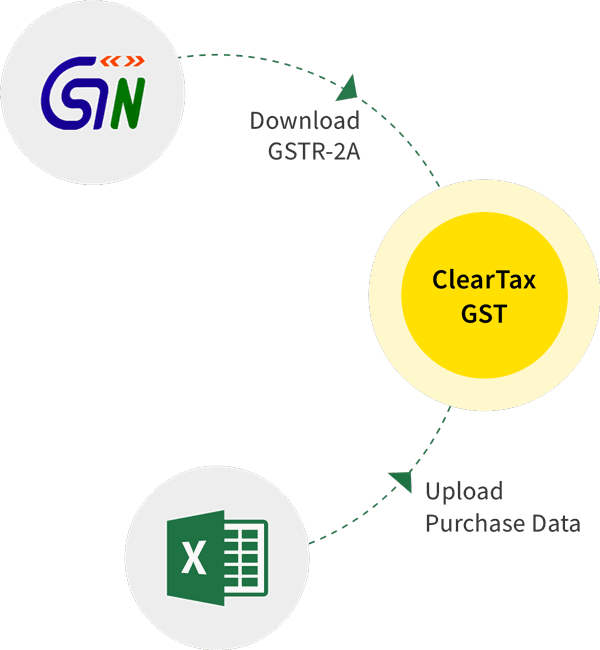 ClearTax GST Software will take care of your ITC by automatically calculating the common credit. We also have an offline GST Calculator which will help you to calculate the tax liability well in advance so that you can be cash ready.